According to Chandler and Lalonde (2008) cultural continuity functions as a protective factor against health risks. Specifically, the authors found that Indigenous suicide rates were a function of cultural continuity, or of the collective capacity of preserving cultural practices and securing local control. They subsequently developed community-level indicators that assess the “sense of ownership of the past and commitment to the future, not at the psychological level but epidemiologically with whole communities as the unit of analysis” (3). These protective factors include: secured aboriginal title to lands; self-governance rights; some measure of control over education, police and fire protection services, and health and social services; established cultural facilities and institutions; participation of women in decision making; and the provision of child and family services. They found that the cumulative effect of these factors reduce suicide to almost zero when all of them were present as illustrated in the following figure (reproduced from Chandler & Lalonde, 2008, p. 240). To unpack contemporary racialization in health discourses and develop a responsive, effective and relevant healthcare for Indigenous peoples the concept of cultural safety (Kawa Whakaruruhau) was developed by Maori nurse Irihapeti Merenia Ramsden in the 1980s. Initially “developed to extend the notion of culture to include intersections of gender, class, race, age and other social relations”, “cultural safety became concerned with social justice and quickly came to be about nurses, power, prejudice and attitude rather than the ethnicity or cultures of Maori or other patients” (4)(5). Specifically, cultural safety uses a person-centered model of care that situates overall health within the cultural, historical, economic, and political (the social determinants of health) context of the service users. In addition, cultural safety calls for a critical analysis of institutional discrimination and colonial relationships by challenging the power imbalances inherent in the relationship between the health care provider and the Indigenous health care recipient. 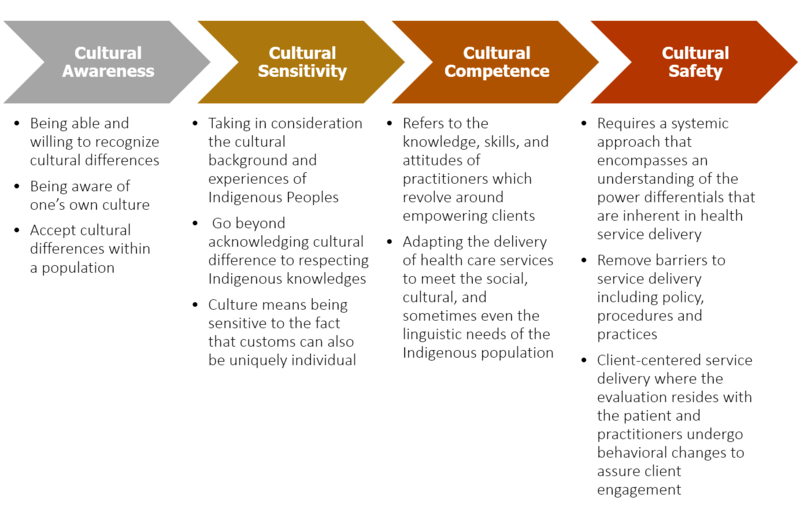 Cultural safety aims to shift this imbalance by empowering the care recipient to actively participate in decisions regarding his or her health (including the type of treatment and care used) while also building the health care providers’ cultural competencies that foster a respectful bicultural encounter. In the Canadian context cultural safety necessitates first an understanding of the impacts of colonization and neocolonial forces on the lives of Indigenous peoples; second, a focus on relationality and cooperation conducive to inclusive support structures; third, the use of respectful (culturally safe) communication and language; and forth, the recognition of Indigenous care-giving knowledges and practices. Culturally safe care therefore requires a systemic transformation (as opposed to only the encounter between the professional and service user) of institutional power imbalances with the goal of decolonizing the healthcare system and strengthening local autonomy. In sum, culture-based activities and services build positive identity and strengthen relationality by creating a sense of belonging and responsibility for the collective. Empowerment and agency are understood as a “confident place from which is possible to take action” that rests upon “negotiating trust in others” (1). In many ways, empowerment is contingent on compassion or understanding individual life-histories as they intersect with broader social processes. If the legacy of residential schools has had a negative intergenerational impact on Cree families, culture-based healing functions in a similar way by mending relations within families. As Larry explains, there is much hope for the coming generations if children grow up with a positive cultural identity. At the individual level then, linking with an Indigenous past restores pride and positive identity, which in turn strengthens self-confidence and improves familial relationships. At the collective level, culture-based programs and services are expected to be delivered alongside clinical interventions in way that reflects place-based social institutions. Incorporating Cree values and practices into service provision means moving beyond the Western medical model in order to base programming on Cree healing and care-giving practices. 1. Allen, K. (2000). Negotiating Health: the meanings and implications of 'building a Healthy Community' in IgIooIik, Nunavut. (Masters), McGill, Montreal. 2. Chandler, M. J., & Lalonde, C. E. (2008). Cultural Continuity as a Moderator of Suicide Risk Among Canada's First Nations In L. Kirmayer & G. Valaskakis (Eds. ), The Mental Health of Canadian Aboriginal Peoples: Transformations, Identity, and Community. (pp. 221-248). Vancouver: UBC Press. 3. Lalonde, C. E. (2009). Can a community be called "mentally healthy"? Maybe, but only when the whole really is greater than the sum of its parts. In Canadian Institute for Health Information (Ed. ), Mentally healthy communities: Aboriginal perspectives (pp. 33-37). 4. Smye, V., Josewski, V., & Kendall, E. (2010). Cultural Safety: An Overview. Mental Health Commission of Canada. 5. Ramsden, I. (2002). Cultural safety and nursing education in Aotearoa and Te Waipounamu. (PhD), Victoria University of Wellington, Wellington. 6. Baba, L. (2013). Cultural safety in First Nations, Inuit and Métis public health: Environmental scan of cultural competency and safety in education, training and health services. Prince George: National Collaborating Centre for Aboriginal Health. 7. Brascoupé, S., & Waters, C. (2009). Cultural safety. Exploring the applicability of the concept of cultural safety to Aboriginal health and community wellness. Journal of Aboriginal Health, 5(2), 6-41. 8. Health Council of Canada (HCC). (2012). Empathy, Dignity and Respect: Creating cultural safety for Aboriginal people in urban health care. Toronto: Health Council of Canada. 9. National Aboriginal Health Organization (NAHO). (2008). An Overview Of Traditional Knowledge And Medicine And Public Health In Canada. 10. National Collaborating Centre for Aboriginal Health (NCCAH). (2013). Towards Cultural Safety for Métis: An Introduction for Heath Care Providers. 11. Anishnawbe Health Toronto. (2012). Aboriginal Cultural Safety Initiative. 12. Main picture by Milton Matthew.